THE TRIP IS FULL! We are no longer taking sign-ups, but if you’d like to be placed on the waitlist, please let a crew member know. Being on the waitlist does not ensure there will be space for you on the trip. We will contact the next person on the waitlist if any spots become available. 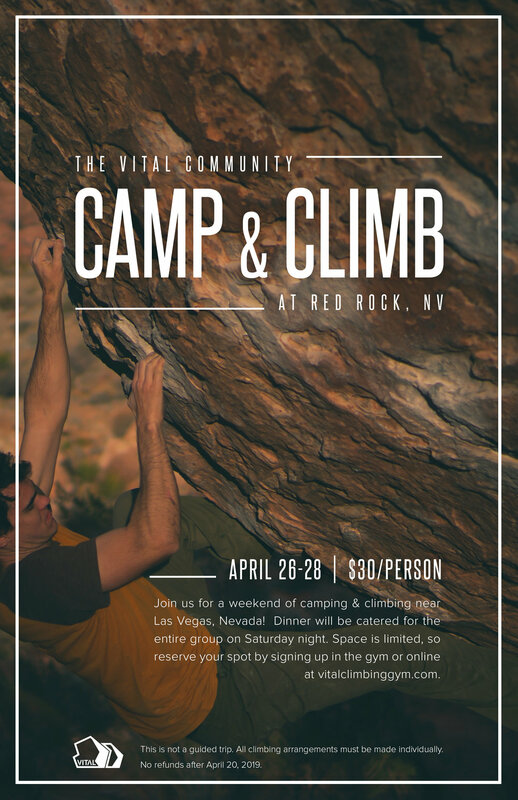 If you are already signed up and are no longer able to attend, please email Luis@vitalclimbinggym.com before 4/20/19 for a full refund. No refunds will be made after 4/20/19. Note: We will be providing mandatory Outdoor Ethics clinics prior to the trip, however, this is not a guided trip. All climbing plans must be made individually. No refunds after April 20, 2019. The trip is full! Please speak to a crew member in the gym to be added to the waitlist.